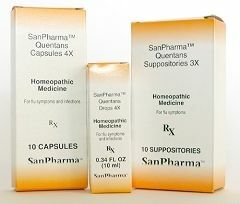 * Quentans is considered the "master remedy" for support of viral infections in the SanPharma line. These immune-metabolics combine very well with PEKANA detoxification remedies, as well as Syntrion SyDetox. 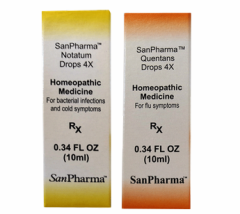 Notatum also is considered the "master remedy" for inflammation in the SanPharma line. Pleo Quent is made from the fungi Penicillium glabrum (syn.) and is used to provide benefit for viral infections. It is also recommended for imbalances where the nerves are affected as seen in multiple sclerosis, neuralgia, sciatica, and headaches, including migraines. It is the fungal phase remedy most often used to provide benefit for influenza, Herpes simplex, Herpes zoster, Varicella (chicken pox) and vertigo. Pleo Quent is available in drops, capsules, suppositories, sips/ampules. Are you looking for an effective alternative to antibiotics? How about a fast-acting and successful treatment for bacterial infections that is suitable for all ages, and is non-toxic with no side effects or negative interactions with other medications? Have you considered using a ‘change the environment’ approach rather than the ‘kill’ approach? If the answer is yes to any of these questions, then isopathic therapy as a branch of Biological Medicine is the treatment modality for you. Biological Medicine utilizes therapeutic practices to work in harmony with the natural capabilities of the organism by promoting regulation, regeneration, adaptation and self-healing. From the pleomorphic perspective, the internal environment is responsible for the formation of viral, bacterial and degenerative physiology. Therefore, the way to counter most infections and bacterial/viral diseases is by modifying the milieu and supporting physiological function. Pleo-Not is an isopathic remedy made from Penicillium chrysogenum, a symbiotic micro-organism that exhibits natural ‘antibiotic-like’ effects in inflammatory processes, infectious diseases, acute bacterial infections, and susceptibility to bacterial infections. This remedy’s forte is in all types of bacterial conditions caused by streptococcus and staphylococcus infections. While usage is often coined ‘from the neck up’ to include sinusitis, rhinitis, otitis, tonsillitis and dental infections or abscesses, it is also effective in conditions including bronchitis, slow healing wounds, skin infections, cystitis and urinary tract infections. It should be noted that Pleo-Not is not the same as the antibiotic penicillin. This remedy (Pleo-Not), made from the Penicillium micro-organism neither contains nor produces penicillinic acid, so it can safely be given to patients with penicillin allergies. In addition, its use is not accompanied by side effects which are common in antibiotic treatments such as allergies, liver damage, destruction of intestinal flora and evolution of penicillin-resistant strains. Therefore, if you are looking for a safe and effective alternative approach to restoring the balance within the body and reducing pathogenic bacterial forms with a ‘natural antibiotic’, consider using Pleo-Sanum isopathic therapy and specifically the remedy Pleo-Not.